History Heroes, How well do you know your Explorers? 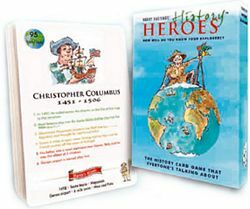 is an educational and competitive card game designed to encourage learining historical facts as well as to develop a greater understanding of our past and present world. Each of the 42 cards depicts a different explorer from the past. A player wins a card when they can identify the explorer from the picture or fact from their opponent’s hand. The game is won by the person who holds the most cards after a certain time or who captures all the cards from their opponents!